This family penzion ivites you to a pleasant stay in Špindlerův Mlýn. Pension is really located in the downtown and concurrently you will find here peace and quiet. 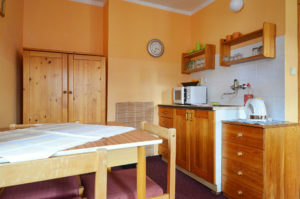 There are ready to use the microwave, kettle and fridge for the guests. We offer the possibility of renting the whole pension for friendly or working meetings. Pension Centrum is ready just for you. We are honored that you have shown interest in accommodation in our family pension. 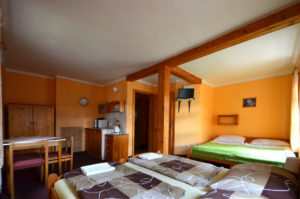 Most visitors of Špindlerův Mlýn prefer quality but cheap and clean accommodation in the center of Špindlerův Mlýn – best in minutes walking distance of restaurants, shops, clubs and skibuses. In these conditions, one more parameter is emphasized – accommodation in a quiet part of the center. We can assure you with humility that we meet all these conditions. It is important to emphasize that our pension is close to the wellness hotel Windsor **** and you are only 40m away from our pension. There is a sauna world, a swimming pool and unmatched Thai massages. So do not forget to pack your swimsuit, and we’ll make sure you have a perfect wellness stay or maybe relaxation. With regard to the location of our pension, there will be satisfied lovers of good food and fans of light tourism, as well as friends of alpine tourism or mountain bike lovers. 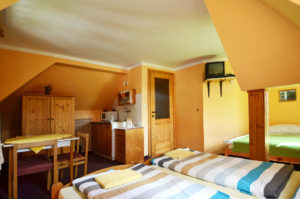 The guesthouse also has four-bed rooms, so it is very popular with families with children. With respect to our discretion, our pension is sought after by couples who enjoy our location, helpfulness and privacy. For cycling lovers we offer bicycle depository facilities in our guesthouse. 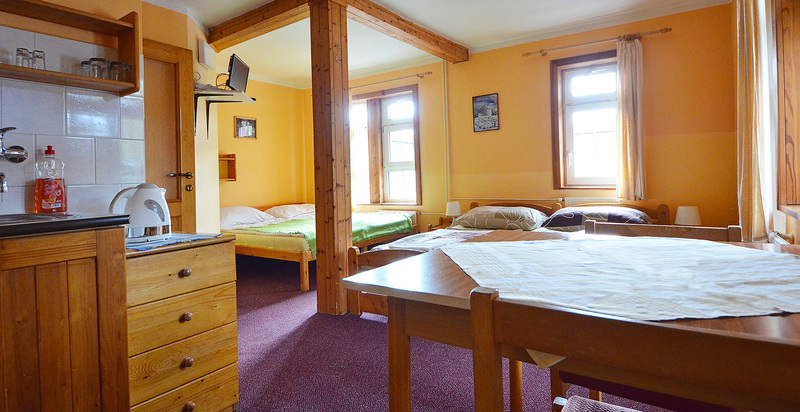 A ski room is also part of the pension. 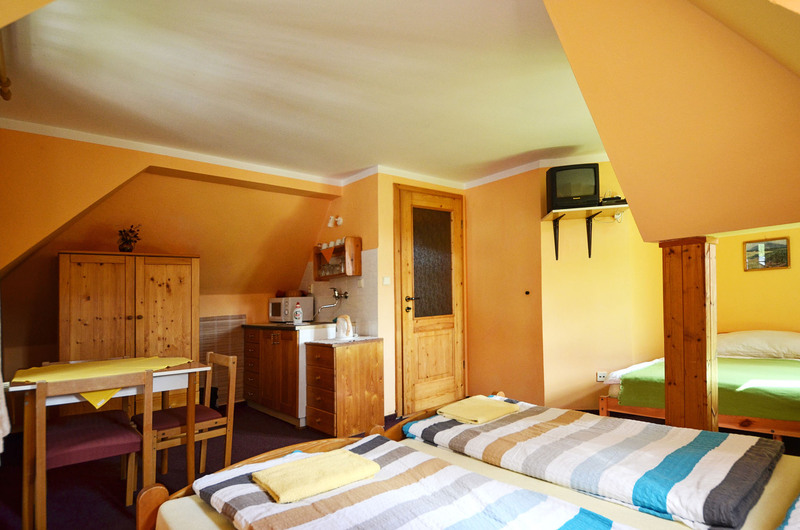 Our guesthouse is right in the center and within easy reach of cable cars and lifts. The lift Hromovka, which takes you to Skiareál Sv. Petr is 700 meters away. Svatý Petr Ski Resort is 800 meters away and you can also take the skibus there. The Medvědín lift – also an excellent starting point for the hike on the Source of Elbe. The lifts for Pláně and Medvědín transport baby prams and bikes free of charge. The bus station is within 450 meters – where a bus to Špindlerova bouda runs regularly – also the ideal year-round starting point for your trips. You can park your car about 100m from the pension. The price of parking is 75 CZK / night – all year round. In winter, you can also take advantage of the free P1 car park, 1 km away from the penzion. In summer P1 parking is charged at 150 CZK. Our car park has the same price throughout the year 75 CZK / day. We believe you will make use of our services and will be happy to return to us as most of our regular clientele.